There is always plenty to do on the last day of tent revival but we had a few added steps on Friday. Bro. Larry and Sis. Rosemary Landress had stored my tent trailer since February. I had drove down to get it Wednesday and had sorted and strapped down some of the stuff inside on Thursday. Friday I hooked onto it with the bus and twirled it all around so it would all be in place to ride after church. I also made sure it was ready to ride inside and blew all the dirt and debris out too. Right before setting up the sound system Friday evening we loaded the Green Machine inside the trailer. We had lunch with Bro. Mitch and Sis. Lynn Boggs and their four youngest boys and Pastor Jeremy Brooks and his family. We had a wonderful visit and before we knew it almost two hours had passed by. We had a few friends drop by the tent from Kansas and Texas. After setting up the sound system, Bro. Jimmie worked on getting the trailer ready for the tent as well. The tent take down goes so much smoother when everything is organized and ready to go. 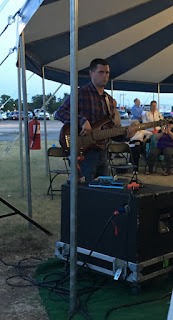 We had a great crowd Friday night and a great service too. It was great to see folks praying and getting help from the Lord! 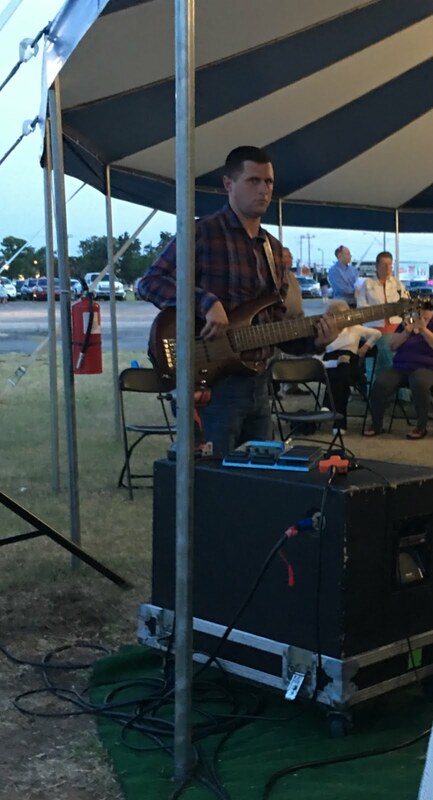 Something interesting happened at City Reach OKC Friday night. There was a woman that came to the altar and God helped her. She was telling later that she attended City Reach Wichita back in September. She just moved to Oklahoma City and passed by the Blue and White Gospel tent and decided to attend the last service. She had no idea it was the same tent she went to in Wichita with the same evangelist too. She was amazed and so were we! It seems to me that God loves that precious woman and is going out of His way to speak that love to her! Praise God! As soon as service was over Friday night we packed everything up and headed out! Bro. Jimmie drove to Sapulpa, Oklahoma (his home base) and we drove about 215 miles to the rest area near Joplin, Missouri. We arrived about 2:45 AM and about an hour later I crashed into bed, exhausted from a long, long day. This is the BoggsMobile and the tent trailer Saturday morning at the rest area. We were going to meet Bro. Kurt McCrorey around 10:00 AM at a truck stop in Joplin but they had a family member in the hospital in Springfield and were delayed. Bro. Kurt sent a couple of young men including his son to meet us about 2:15 Saturday afternoon. It was an important meeting because they were bringing my library that Bro. Kurt has stored and protected lovingly for over 13 1/2 years! After it was all strapped down, we loaded the car back in the trailer and hit the road about 3:00 PM. It was probably 90 degrees in Joplin and super sticky with humidity. Less than three hours up the road it was barely 60 degrees and felt wonderful! We drove until about 8:00 and decided to get a bite to eat once we were east of St. Louis. We parked at Walmart and by then we decided to call it a day. I probably slept better Saturday night than I have in weeks! We hit the road Sunday morning and though we had a safe trip, most of the day looked exactly like this! We pulled into the Lazy OD Ranch about 5:00 PM on Sunday and Dad and Mom were waiting on us. It was super great to see them again after 6 months. I dropped the trailer in the driveway and Kelly Jo pulled the BoggsMobile in the barn. It is good to be back. We hooked Dad's truck to the tent trailer and parked it next to the barn. After catching our breath we slipped down to our favorite little Mexican place in Lebanon. I loved being back at Acapulco and evidently they were glad to see me. You think they know I love the salsa? That pretty much wraps up our busy weekend. We had a great day Friday at City Reach OKC, I was reunited with my books on Saturday and drove nearly 900 miles to arrive safely at the barn. Not a bad weekend. Today I hope to work some here and then tomorrow we will begin the physical preparations for City Reach Dayton.